I recently led a printmaking class for two groups of 1st graders. We drew scientific illustrations of plants, creating a printing plate, and made prints focused on the themes of growth, greenery, sustainability, and nature. I hope you enjoy reading through the process and viewing photos of our project! When the Pantone Color of the Year was released back in December, my creative senses piqued immediately. Greenery evokes a fresh and invigorating energy - something that I desperately need starting the 2017 year. I am excited to incorporate this color into designs in the coming year. What does the color Greenery represent to you in 2017? When I heard that an Andy Warhol exhibit was coming to the Portland Art Museum, I cleared my schedule for that following weekend. As a frequent museum-goer all over the states and abroad, I've seen quite a few Warhols in my day, but I knew this exhibit would rival any showing I'd seen in the past - and it did. When we entered, we walked into the main foyer of the museum that was covered in Warhol-esque wall paper, Mao Te-Sung prints, and featured a beanbag area to sit and ponder the work. 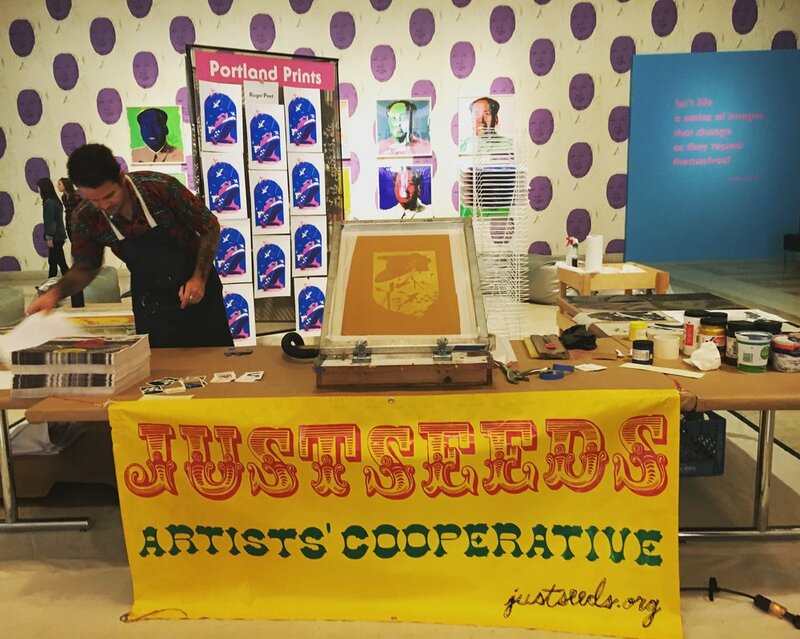 Select artists from the JustSeeds Artists' Cooperative also scheduled times throughout the exhibition to demonstrate the silk-screening process. After exploring the foyer, we headed up to the 2nd floor of the museum to work out way through the exhibit in chronological order. We started in the 1950s, when Warhol was making advertisements and hilarious, illustrated books. We then entered through a foiled "portal" into the 1960s. The next room held the Marilyn Monroe and Jackie Kennedy portraits, flowers, and soup cans that most know Warhol for. The Portland Art Museum's wall texts did a wonderful job of giving historical context to the work. While I studied Art History and was aware of many of the outside forces inspiring and affecting Warhol, the people I was with truly appreciated this fascinating insight. I found the "Birmingham Race Riot" screen print depicting police brutality especially pertinent to today's political and social climate in America. In fact, there have been multiple police protests in Portland over the last several months alone, including one that took place at the PAM. A group called Don't Shoot PDX protested in a peaceful forum in partnership with the museum and acted as an open dialogue between police and the Portland community. I am grateful that the Portland Art Museum is an advocate and can help groups find a louder voice within the community about social issues that truly matter. I found his flower studies intriguing as well. There was a dynamic movement and musicality that they evoked - I could have sat in this room a long while feeling the artwork swirl around me. Down the staircase, we entered the last room of the Warhol exhibit. This room was filled with works from the 1970s and 80s. This impressive exhibit spans four decades and includes every style of Andy Warhol's work. If you are in the area, this exhibit is not to be missed. On through January 1, 2017 - plan your visit today!